IF I WAS a snake, where would I be? It's a question snake catchers have to ask themselves every day... but the answer is not supposed to be "back at my house". That was the case last month for Sun Valley snake catcher Mike Boen, who was out of town helping a family friend when he got a call from his wife Dorothy. She told him there was an eastern brown snake under their barbecue - the second-most venomous snake in the world. "It gave my wife a fright, and the dog and the cat as well," Mike said. "It had gone right into the carport when she found it so it couldn't get out except by going past her." Mike said Dorothy did the right thing by throwing down some towels in front of the snake (from a safe distance) and calling him, a trained snake catcher, for help. Snakes released at Yarwun by catchers: Snake catchers Mike Boen and Jason Gibb showed The Observer reporter Declan Cooley how they release snakes. 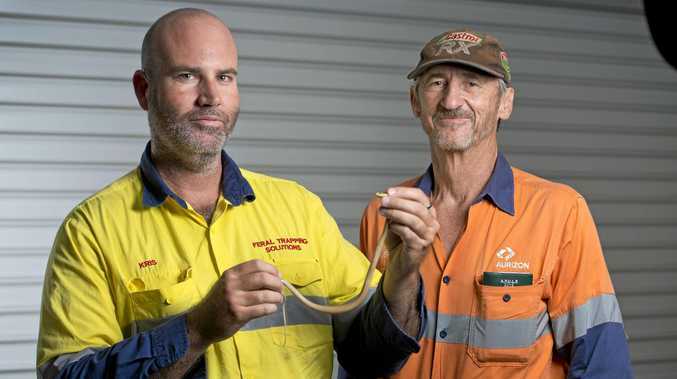 But rather than race home himself, he called his friend and fellow snake catcher Kris Foster, who was "just around the corner having lunch" at Telina. "I knew he could get there quicker than I could," Mike said. When Kris arrived, he quickly bagged the venomous visitor like the professional he is. "I used the standard equipment - but I've always got a bandage in my pocket if things go wrong," Kris said. "That's the second time I've been to Mike's to catch a snake... they must not know he's a snake catcher." Both men said the easiest way to avoid run-ins with snakes was to carry a torch when walking at night and to keep things like boots, boxes and dog bowls well away from your house. If you need a snake removed, call Kris on 0439 666 102.